Minor spoiler warning: This story references specific scenes and locations in Planetarian, although it does avoid major details. If you are an anime fan then it’s likely you will be familiar with Key, even if not by name you might at least be familiar with the shows based on their works. Many of their visual novels have become fan favorites, whether for their original incarnation or for the aforementioned anime adaptations that have managed to affect so many of us. They have produced classics that have meant so much to me such as Kanon and Little Busters as well as the emotional hit Clannad. But today I wanted to look at what might be one of their least recognized titles, Planetarian. This visual novel released in Japan in 2004 and finally saw a worldwide release in 2014. Most recently it arrived on the Nintendo Switch, which finally gave me an opportunity to take a look. I need to note that Planetarian certainly managed to gain attention when it first released but unlike Key’s other works, which continue to draw attention, it’s fallen a little more to obscurity. Part of this is likely due to the shift in style that Key adapted. 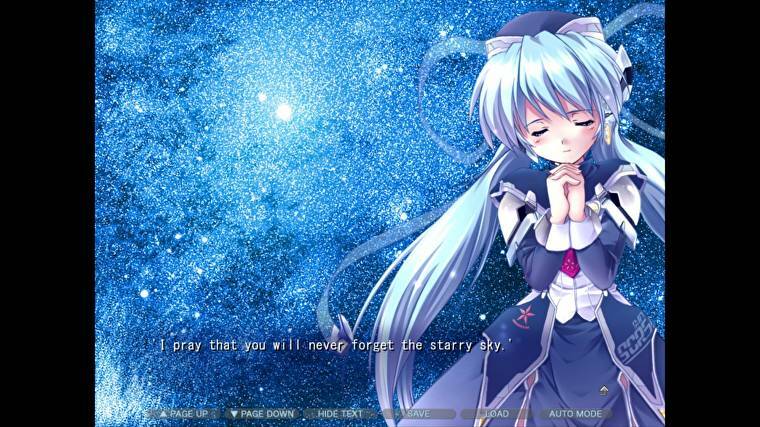 Compared to bigger titles such as Kanon and Clannad which utilized a classic choice-based system, enabling players to explore a variety of paths, Planetarian doesn’t. This is a kinetic novel, akin to modern day efforts such as Nekopara, where you are told a single story and go along for the ride, experiencing the singular tale the storyteller wants you to see. This change in style can be affecting to certain viewers who prefer a little more player agency within their visual novels. Part of the charms of the genre can often be the little choices which allow a sense of freedom, but a question to ask is: is Planetarian enjoyable without any sort of player input? Put simply, yes. Although the real question I wanted to ask is which method is better for viewing this tale: the visual novel or the anime adaptation? What method is the most ideal to tell the story in a manner that is effective and more enjoyable to a viewer? Can the TV anime better express the story? It certainly worked for some of Key’s previous works, but what about this one? What makes Planetarian a little trickier to discuss in this manner is how straightforward it is. 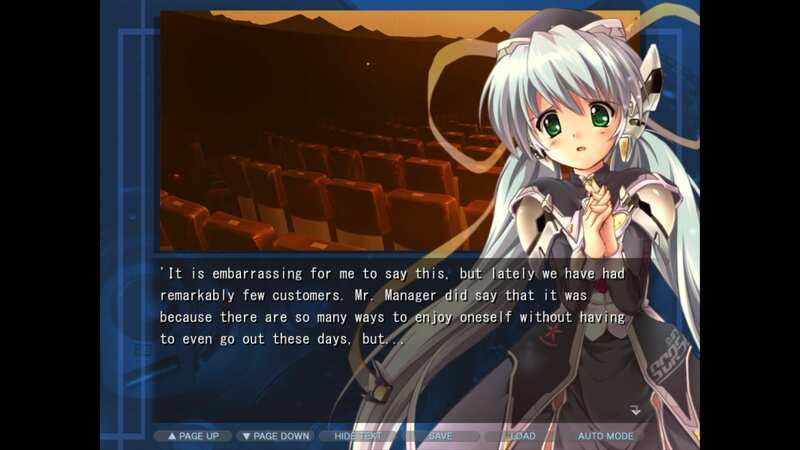 Where more choice-based visual novel adaptations are able to adapt better pacing and a greater sense of storytelling to build emotional audience investment, Planetarian only has a singular narrative to adapt. It becomes a question of delivery in terms of voice acting. Which scenes pop more with story direction on a static image over a fully animated representation? In terms of this particular story, experiencing both versions within a short window enabled me to see where the anime adaptation added certain moments for the better. I could also see where the two versions’ strengths and weaknesses were in terms of pacing, and see where the anime left some elements forgotten due to a certain detriment. The story describes the world’s destruction better than this picture. I must preface this by stating that my discussion of the two versions is only in the context of the visual novel and the anime series. There is a film that expands upon the events of the series and visual novel that might mitigate some of my points but that discussion might be for another time. At the time of writing I have only found a way to watch the anime series through Funimation, and have found no means of watching the film so no points can be made about what the film does. It’s worth noting that the film is something of a followup rather than a direct adaptation, which would go against discussing the nature of two versions of one story. With all that said let’s talk about Planetarian and discuss the strengths and weaknesses of both versions. Planetarian tells the tale of a dead world. A thirty-year war has left humanity on the brink of extinction with the only remaining humans living in tiny settlements. Murderous robots from the war roam the streets of sarcophagus cities, the uninhabited remains of once vibrant cities, intent on killing any who foolishly wander into their territory. The effects of nuclear warheads and an assortment of other armaments have destroyed the atmosphere, leaving the world constantly blanketed in hazardous rain, making life harder and destroying the very notion of the stars’ existence. The tale itself follows Junker, a man scouring a sarcophagus city in search of salvageable items left behind. But after being set upon by a group of deadly robots he finds himself taking shelter in a shopping complex which houses a planetarium. Here he meets Yumemi, a robot girl who works for the planetarium, who due to a lack of power from the war comes to life for only 168 hours a year. Yumemi sports a bright demeanor, not understanding what happened to the world, along with an insatiable need to help and make people smile, all this much to Junker’s dismay. She is essentially a relic of the past, a cheerful light in a dark world where the concept of happiness is lost to the act of surviving. The end of the world drags down even the magic of viewing the stars. The visual novel paints a bleak picture of the world. It constantly echoes the melancholy of the rain, reminding us of how it consistently falls. The novel paints a bleak world noting that through the dangerous weather much of the city has been left in ruins. Buildings have rotted, windows have vanished and general coverings have gone absent. Through the short trip we get through the city or while inside the planetarium we get an impression of how the rain has made things worse. The lobby of the planetarium is a dark place where Yumemi regularly stands reciting her favorite mantra, rain dropping on her through what was once windows on a door, as she waits for customers who will never come. Throughout the city we see the way the constant rain has warped the ground. Little bumps and cracks make traversal difficult if you aren’t paying attention. Places that were once shielded from the rain have eroded, and nary a building stands that doesn’t tell the tale of some greedy person, a remnant of war, or just the effect of time combined with the rain. I bring all this up in an attempt to paint a picture which the visual novel paints so vividly with a few static images and well-chosen words. It’s such a simple medium that helps to sell the effects of war and especially of the horrific weather upon the world which is hammered in consistently. This is where we get to some of my first issues with the anime adaptation. The series downplays the rain and its effects. Sure the rain constantly barrels down and has warped the dead roads, but the visual novel treats it as something that causes pain if skin is exposed, with Junker constantly ensuring he is covered while outdoors. Junker even mentions its negative effects mourning over the loss of his gloves which were protecting his hands from the pain the rain caused. The anime doesn’t do this. We see Junker with his cloak outside but the rain just casually falls on his head with no concerns. This very connotation changes an entire element, not including the detail on its effects undermining certain decisions made by anime Junker. Anime Junker doesn’t seem to be very careful with the dangerous rain, oh wait they forgot that. In the visual novel when Junker sees Yumemi standing in the rain he holds some concern. Even though Junker is characterized as a cautious grump – only natural due to the state of the world – he does worry slightly about Yumemi getting hit with the rain. He plays it off, but quietly thinks about it. 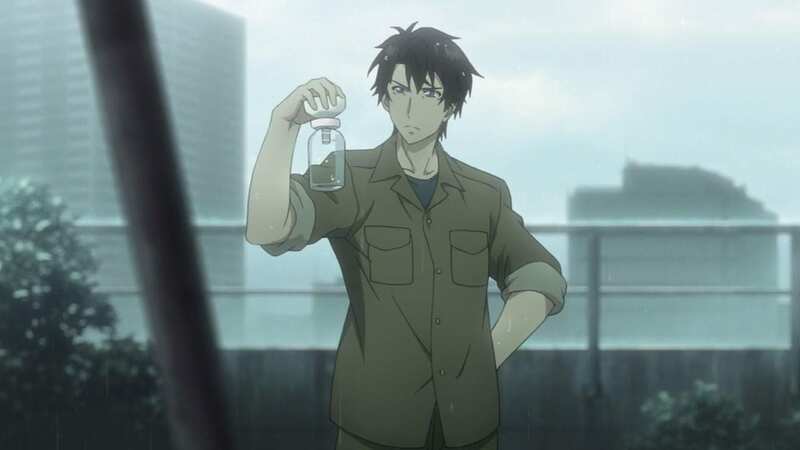 In a later scene where the two wander through the city for his piece of mind, Junker gives her a rain cloak for added protection, whereas the anime has the two just casually sit or stand in the rain on a couple of occasions with little concern. Yes the anime does establish that she is waterproof like the visual novel but there is less concern which makes him giving her a rain cloak later on seem out of place. Even then as the anime never sees him expressly give her the cloak it can be assumed it’s his but it’s played off like an unimportant detail, which in the visual novel is a touching moment and important character development. Going back to the environment and the rain’s effects, with the exception to the natural warping there is never any clear signs of the rain’s disastrous effects. If you were to look at the reception area in the planetarium in the anime and visual novel you would note clear differences. In the visual novel, while the windows in the reception area are filthy, one is broken which Yumemi regularly stands by. Also notable is how the reception desk sits next to the doors. What was once an atrium outside now lies glass-less and in disrepair. The anime pushes the doors back into the atrium, an area that as mentioned is supposed to be in ruin. Besides that all windows are intact and are simply filthy. These may seem like small details to change but it does affect so much about the weather. Take for instance a later scene in the anime that shows an entire six-story building that still has windows all intact. This makes less sense considering the war, and is mentioned as being in decay in the visual novel. The way it’s described the windows should either be in disrepair or have melted away thanks to the rain. You can see the atrium and broken window behind Yumemi, stupidly not the case in the anime. In the context of the storytelling it’s the seemingly minute details left on the anime that hold weight. It’s the choices that play against world building. Of course, if you were to watch the anime without reading the visual novel you would think nothing of it, but in turn it’s these design choices that matter. To an anime-only viewer the dark world seems to hold merit but the real scale of the environmental destruction is left unfounded with much of its darker implications left out and put on viewers to consider. Not that they can easily grasp some of the darker elements without understanding the weather within this world, as it’s not just war and robots that destroyed so much. Similarly there are other visual choices made in the anime that make no sense without context. Around the midway point of the story Junker watches a projection at the planetarium. His viewing experience is guided by Yumemi who paints a beautiful picture of the story of man and the stars, covering the context of Greek mythology and its connection to many of the constellations. Partway through the power is cut off and Yumemi is asked to tell the story without the visuals, leaving Junker to imagine. 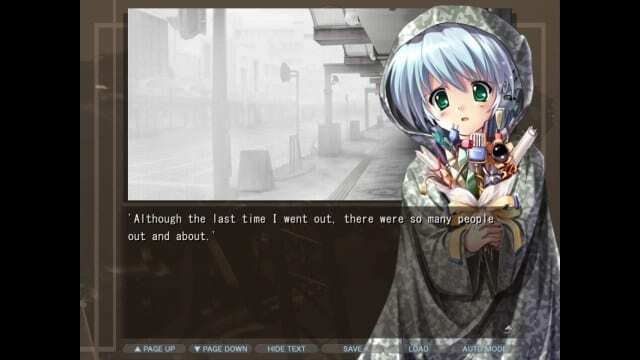 In both versions of the story Yumemi is very descriptive making for a powerful scene, but the anime uses imagery that makes no sense to a non-visual-novel player. The original story details the significance of important moments in history and their inevitable connection to the stars, to man’s push towards the stars. Consider people like the Wright Brothers and the airplane, or the dog who went to space but would never come home. But the anime just flashes famous historical pictures which could be misunderstand without the context. It almost seems like they expect viewers to have some notion of history and the stars before watching, which many of us don’t have. Just from this short time looking at visual differences and connotations I imagine that anyone reading this would assume I hate the anime. It almost seems like a given that I would jump and say read the visual novel and skip the anime. Sure, there is merit to that, though I think the visual novel definitely complements the anime’s shortcomings. But don’t write off the anime yet. For the sake of leaving this first half as spoiler free as possible and simply throwing the idea of Planetarian into your mind I will further address the series looking at specific scenes between the anime and visual novel. Consider this my gripes with the anime in terms of bad design choices, but we are still far from done. I love this quote against the stunning background. 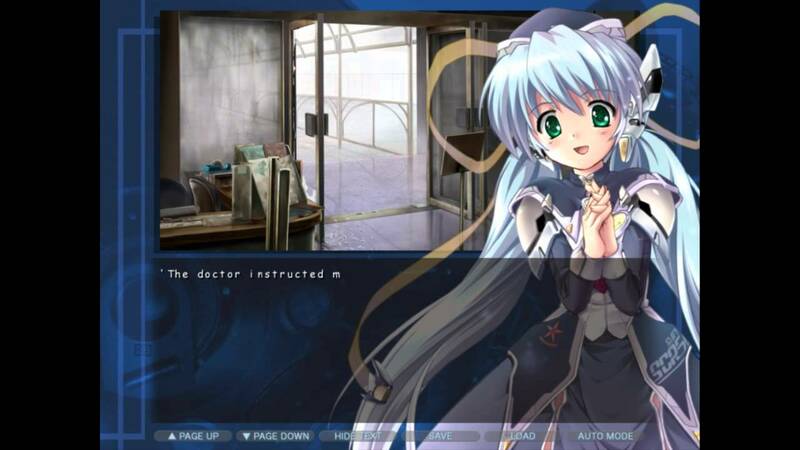 For now I want to end this by saying that if this has in any way made you curious to check out Planetarian, the visual novel did recently release on the Switch. Even for a fifteen-year-old visual novel the story holds up really well, with the music and imagery still being incredibly captivating. Without coming to a conclusion I still would implore you to check out the visual novel, which if you don’t have a Switch can also be purchased on Steam and Mobile. Also if you are interested Planetarian is available to watch on Funimation Now. Please come back for part two which will paint a greater picture on the storytelling and characterization differences between the visual novel and anime and finally come to a conclusion. So don’t decide just yet since the information I have talked about is just scraping the world-building barrel.